Jewish schoolchildren forced to bow and mimic Muslim prayer in Mosque while on school trip. 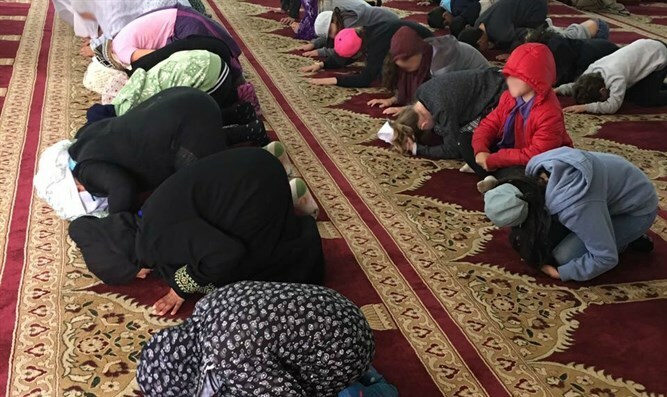 The Yad L'Achim anti-assimilation organization slammed a report by Channel 20 that Jewish schoolchildren from an elementary school in Caesarea were forced to bow in prayer in a Mosque during a school trip to Jisr az-Zarqa, an Arab-Israeli town north of Caesarea. "Assimilation in Israel has taken on a new form. This craving for multiculturalism in Israel is making people insane," said the leaders of Ya L'Achim. They added: "this incident joins a bizarre bill which was placed on the table in the Knesset last weekend, 'chag hachagim' (holiday of holidays). Jewish identity and the fundamental values of the Jewish people are attacked over and over again here in Israel, out of a desire for tolerance of other religions." They warned that the focus on multiculturalism would "end in baptism and conversions." The incident was brought by horrified parents of the children who were forced to bow in the Mosque.